The United Nations (UN) in Zimbabwe celebrated its 73rd anniversary on 26 October 2018, marking the founding of the UN Charter on 24 October 1945 which enshrines UN commitment to the people of the world on Human Rights, Peace and Security, and Development. The United Nations, born out of the ashes of a catastrophic world war, has become the embodiment of humanity’s resolve to save succeeding generations from the scourge of war. In a world characterised by increasing inequality, poverty and insecurity coupled with rising poplularism and unilateralism, individual countries are ill equipped to deal with these challenges in isolation. Collective action through multilateral organisations, with the United Nations at its apex, remains indispensable in ensuring global peace and development. 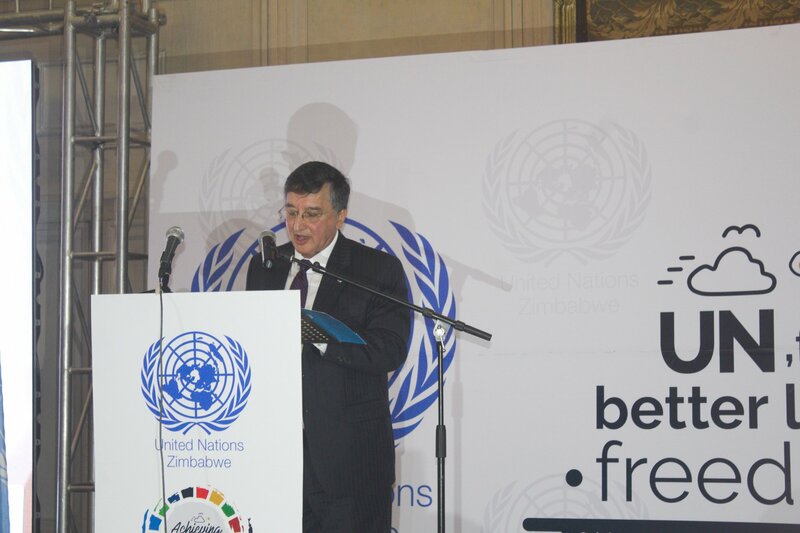 In his keynote address, Mr Bishow Parajuli, the UN Resident Coordinator noted that UN in Zimbabwe is assisting the government in attaining the Sustainable Development Goals which are bold, ambitious and transformational. SDG’s are holistic in nature and can be adopted by less developed and developed countries. Ambassador then alluded that through the SDGs; UN is providing a unique opportunity to put the whole world on a more prosperous and a sustainable development path. The United Nations in Zimbabwe through the Zimbabwe United Nations Development Assistance Framework (ZUNDAF), continues its support in poverty reduction, advancing good governance, gender equality and enhancing service delivery in education, health, water and sanitation as well as food security. Vice-President Kembo Mohadi, who was the Guest of Honour, articulated that the Government is committed to promote and fulfill the UN 2030 Agenda for SDGs as they are in line with the President’s vision of making Zimbabwe a middle-income by 2030. Honourable Kembo Mohadi also implored the UN to democratize by reforming the UN Security Council through ensuring equal participation and representation for all continents. He pointed out that Africa should be given a permanent seat within the UNSC. Countries should continue to place their faith and trust in the UN system as it is a means for addressing the myriad of challenges affecting the globe today and is the one of the plausible way to seek a just, prosperous and peaceful World.